Set the capacity of an Aurora Serverless DB cluster to a specific value with the AWS Management Console, the AWS CLI, or the RDS API. Aurora Serverless scales seamlessly based on the workload on the DB cluster. In some cases, the capacity might not scale fast enough to meet a sudden change in workload, such as a large number of new transactions. In these cases, you can set the capacity explicitly. 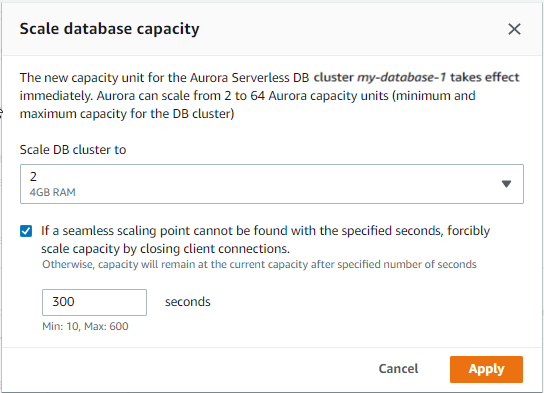 After you set the capacity explicitly, Aurora Serverless can automatically scale the DB cluster. It does so based on the cooldown period for scaling down. When you set the capacity explicitly, connections that prevent Aurora Serverless from finding a scaling point might be dropped. For more information about scaling points and cooldown periods, see Autoscaling for Aurora Serverless. You can set the capacity of an Aurora DB cluster with the AWS Management Console. Choose the Aurora Serverless DB cluster that you want to modify. For Actions, choose Set capacity. In the Scale database capacity window, set the capacity. To set the capacity of an Aurora Serverless DB cluster using the AWS CLI, run the modify-current-db-cluster-capacity AWS CLI command, and specify the --capacity option. Valid capacity values are 2, 4, 8, 16, 32, 64, 128, and 256. In this example, you set the capacity of an Aurora Serverless DB cluster named sample-cluster to 64. You can set the capacity of an Aurora DB cluster with the ModifyCurrentDBClusterCapacity API action. Specify the Capacity parameter. Valid capacity values are 2, 4, 8, 16, 32, 64, 128, and 256.